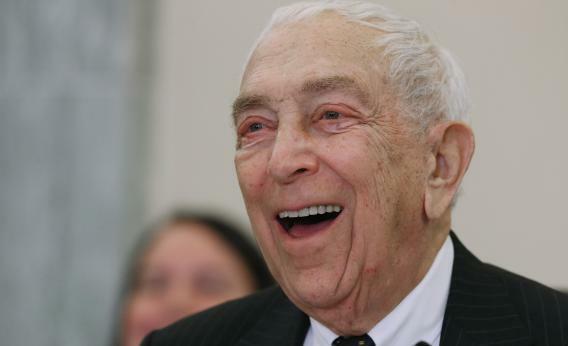 Sen. Frank Lautenberg dead at 89. Sen. Frank Lautenberg (D-NJ) at a committee hearing on Superstorm Sandy on December 6, 2012 in Washingon, DC. You’d be hard-pressed to find a profile of Sen. Frank Lautenberg, who died early this morning, that doesn’t contain the word “irascible” somewhere. But his personal mantra from this 2002 New York Times profile—“To rest is to rot”—is an even better embodiment. Here’s a quick roundup of what other politicians are saying about him. Today I am shaken by the loss of the Senior Senator from New Jersey – a colleague and my good friend and ally. Frank Lautenberg loved his job and the people who elected him 5 times, who trusted him to always be on their side, and he always was. He was a man for New Jersey, a man for his time, one of the greatest generation, the last in the Senate to have served in World War II. His story was an American story. He was a man who joined two of his boyhood friends to found a successful business. He did well, and gave something back and New Jersey loved and admired him for what he did for this nation, what he did to help them build a better life for themselves and their families. Whether it was his landmark drunk driving law, the 21st Century GI Bill, or the “Toxic Right to Know” law empowering the public to know what pollutants are being released into their neighborhood, he was a fighter for New Jersey’s working families and the causes he believed in. And, in death, New Jersey’s love and admiration for him will not diminish. Our thoughts and prayers go out to his wife Bonnie and his family. Today, the American people lost a true champion. For three decades, Senator Frank Lautenberg worked to make America a stronger, healthier and safer place to live. His legacy will endure for generations. Senator Lautenberg was a model of leadership and service to me since before I even considered entering elected office. He was a passionate advocate for New Jersey and a crucial and tireless partner who always delivered for the people of Newark. Our thoughts and prayers are with the Lautenberg family. Chuck Schumer: "Frank was a close and loyal friend who never put on airs and said what he thought, when he thought it." It was with great sadness that I learned of the passing of my dear friend Senator Frank Lautenberg. A stalwart of the Senate, Frank’s dedication to his country and his constituents was unparalleled. Frank was a champion of the middle class, a relentless warrior for all those in need. As a fearless defender of our environment, Frank helped bring the climate crisis into the mainstream while simultaneously promoting clean energy for a sustainable future. He was a source of wisdom and guidance to all, no matter their side of the aisle. My heart and prayers are with his family today. May he rest in peace. The entire Senate is saddened today by the loss of our colleague, Senator Frank Lautenberg. The Senate’s last remaining World War II veteran, Frank was a patriot whose success in business and politics made him a great American success story and a standout even within the fabled Greatest Generation. Elaine and I send our condolences to Bonnie, the Lautenberg children, and the entire Lautenberg family. Frank Lautenberg lived the American dream and then spent over thirty years of his life fighting to ensure that those who came behind him could do so as well. As the son of poor immigrants who fought for his country in World War II, Frank went on to found a successful business before coming to Congress to fight for those without a voice. From his work to prevent gun violence, to ending smoking on planes, to his commitment to protect families from dangerous chemicals, Frank Lautenberg was a champion for the underserved and underrepresented. Frank was a passionate public servant who was not afraid to fight and vote for what he believed in. He loved the Senate. He retired once but service called him back, and until the very end of his life, Frank made the trip from New Jersey to D.C. to fight for the issues he believed in and the people he represented. He gave everything he had to public service. He will be missed by me and by all those who served with him. My thoughts are with his family and loved ones today. I express my sincere condolences to the family of Senator Frank Lautenberg. Although we were political opponents for a brief time in 2002, I always respected Senator Lautenberg’s service and commitment to New Jersey. As the United States Senate’s last surviving World War II veteran, he served as a constant reminder of the importance in putting one’s country before one’s self. Here are yet more reactions from state lawmakers. Correction, June 3, 2013: This post originally said Lautenberg and Gore served in the Senate together for 14 years.